Idée Labs has created a useful set of online image search tools, including a multicolor search that allows you to filter images using a palette of up to ten colors. Using a spectrum color selector, you can pick the colors you are looking for and it will return only photos that contain those colors. 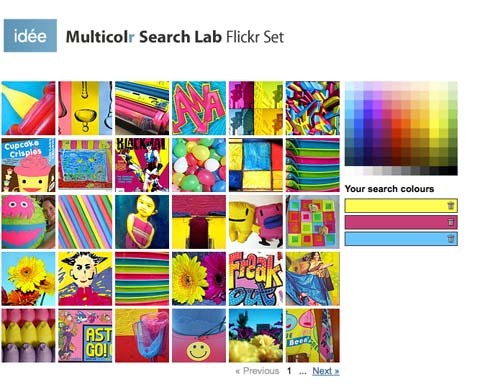 With the Multicolr Search Lab you are able to search up to ten different colors from a palette of 120 different shades. 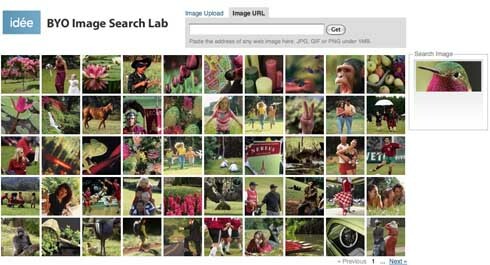 The search will filter through three million 'interesting' flickr photos or three million Alamy stock photos. Idée has also created a visual search. The BYO (Bring Your Own) Image Search Lab allows you to upload an image or enter the URL of one on the internet and find similar looking images from their Alamy collection. Their algorithm looks over one hundred image attributes, such as color, shape, texture, luminosity, complexity, objects, and regions, when doing similarity searching. You may see images in your search results which do not look like the query image overall, but they probably strongly share a few characteristics in particular. The Visual Search Lab combines a keyword search with a visual search. You can select an image to find visually similar images then further refine with keywords, or the other way around. Unfortunately, like the BYO Search, it only works for Alamy and not flickr. Idée Inc. develops advanced image recognition and visual search software. *Thanks goes to Colette for sending along the link to this one. She would have shared it with you herself but has been busy covering E3 and Comic Con for Destructoid and TOMOPOP. Those are some fantastic tools. I logged in and played with them a bit but I found that without the ability to specify exact colors they're kind of limited. Now I suppose you could use one of your color palettes from colour lovers ;) Anyway, great find. OMG..why didn't I know about this SOONER!!! Like when I was making mood boards at FIT? !